Xiaoshan Xu, assistant professor of physics and astronomy at the University of Nebraska–Lincoln, is using a $750,000 award from the U.S. Department of Energy’s Early Career Research Program to develop a novel approach that could advance the field of spintronics. For many people, it doesn’t get much better than modern electronic devices such as smartphones and computers. With a few taps of the finger, we can chat with friends, get a Lyft or skim restaurant reviews at what feels like breakneck speed. 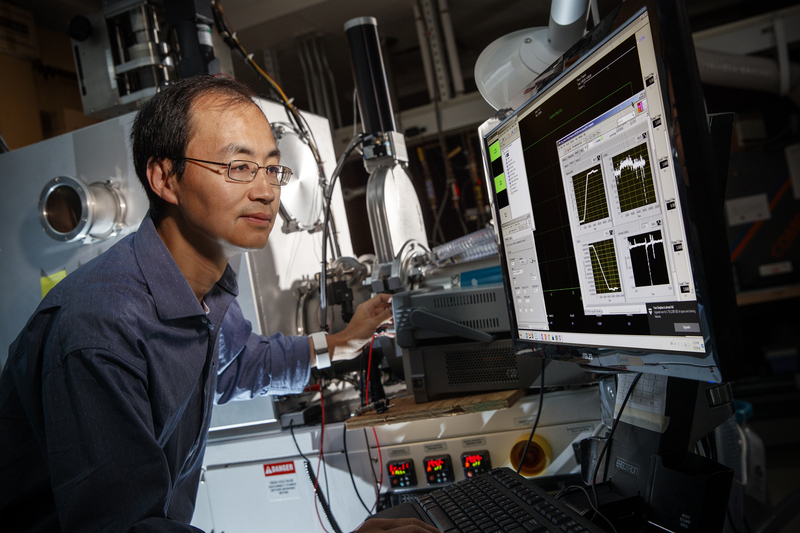 But according to Nebraska’s Xiaoshan Xu, the devices of the future will be even faster, cheaper and more energy-efficient, thanks to a rapidly evolving field called spintronics. He’s using a $750,000 award from the U.S. Department of Energy’s Early Career Research Program to develop a novel approach that could advance basic research in this area. Today’s devices operate by measuring electrons’ charges — positive or negative — as they move through circuits. Spintronics exploits charge, too, but it also capitalizes on another property of electrons: their spin, a characteristic that makes them act like very small magnets. Spin can be “up” or “down.” When enough electrons’ spins are in sync, all up or all down, they create magnetic fields that are measured and stored as information. A major advantage of spintronics is that by manipulating both spin and charge, information processing and storage are faster and more compact. Spin-based devices are also more energy-efficient because electron spin can be maintained even after a power source is turned off. But there are hurdles to clear before spin-based electronics become a reality, and Xu said he’s determined to use his research to address them. Xu’s team is tapping into resources at Nebraska’s Materials Research Science and Engineering Center (MRSEC) to engineer ultrathin layers of croconic acid, which can be sandwiched between two magnetic layers to form a three-layer spin valve that turns electricity on and off in a spin-based device. When the magnetic layers align, electrical current passes through the valve. When the magnets are oppositely positioned, the current is blocked. The valve isn’t a new idea, and it parallels the function of a transistor in conventional electronics. But researchers have long struggled to control spin as electrons move through the middle layer, Xu said. Using croconic acid addresses that problem because it’s ferroelectric: its properties change when exposed to an external electric field. This means that by applying a certain electric voltage to the valve, his team can control electrons’ spin as they travel. This avoids the need to apply a magnetic field, which has a similar effect but uses much more power. Croconic acid also combats another persistent problem in spintronics: short spin lifetime, which means electrons can’t carry information very far. The acid’s lightweight atoms — oxygen, carbon and hydrogen — and its highly organized crystal structure limit interference with spin, lengthening its duration. This translates to longer-distance travel for spin, a prerequisite for more complex applications. Using croconic acid is novel, Xu said, because it’s an organic, or carbon-based, material. Organics are cheaper, lighter and more flexible than their inorganic counterparts. Xu’s team is showing that organics can be produced in large quantities in very thin sheets, paving the way for their widespread use in spin-based devices. Xu credits his partnership with MRSEC, funded by the National Science Foundation, for enabling him to engineer the materials of the future. The DOE Early Career Research Program supports exceptional scientists early in their careers, when many scientists do their most formative work. The program, now in its ninth year, is designed to boost the nation’s scientific workforce.